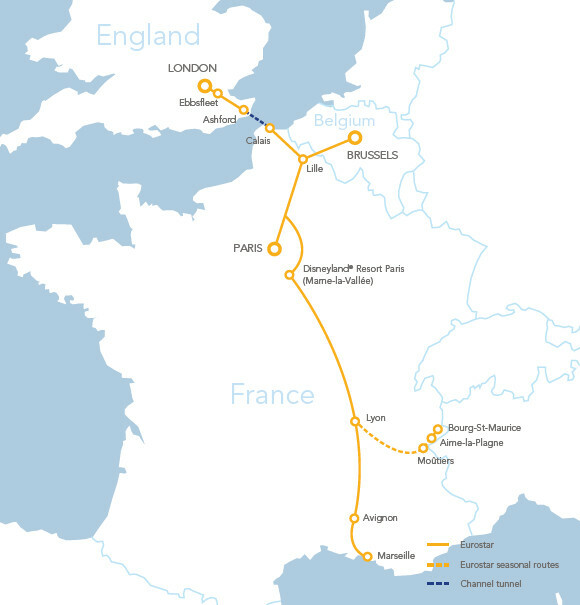 Eurostar services operate from London St Pancras, Ebbsfleet and Ashford to Brussels, Lille and Paris and Disneyland Paris. These high speed trains are capable of speeds in excess of 180 miles per hour and offer a fast and very comfortable journey into Europe. Check-in until 45 minutes before departure, you can arrive earlier of course. Bar Buffet available to purchase food and drinks. In the on-board bar-buffets you’ll find an array of hot and cold, alcoholic and non-alcoholic drinks for sale, including champagne for those moments of pure indulgence. As for food meanwhile you can take your pick and purchase from a selection of quick and tasty snacks alongside a variety of wholesome, hearty dishes. In the quiet, spacious surroundings of your Standard Premier carriage you’ll find the freedom to work, think or simply unwind. Plug your phone or laptop into an on-board power socket, or pick a complimentary magazine from the rack and relax in your large, comfortable seat. As part of your Standard Premier journey our helpful waiting staff are on hand to serve a fresh, light, healthy meal to your seat. As for drinks, you can take your pick from tea, coffee and soft drinks, or maybe relax with a glass of wine or beer. Book a taxi in the Business Premier lounge and beat the queues when you arrive. Simply speak to a member of staff at the reception desk to book your taxi, then look out for your driver when you arrive at your destination. For peace of mind and even greater flexibility, the Business Premier boarding guarantee means you can be certain you’ll travel on the train you need. If you’re running early or late and wish to travel on a different train on the same day as your original booking, we guarantee to find you a seat, even if Business Premier is full. We all know business plans can change at the drop of a bowler hat, and that’s why Business Premier offers tickets that are fully flexible for up to two months. What’s more, our high frequency of trains means you’re bound to find one that will get you where you need to be, when you need to be there. With the self service ticket machines you can avoid the queues and collect your tickets quickly and easily, before breezing through the dedicated Business Premier check-in, which closes just 10 minutes before departure. In the dedicated Business Premier lounges Business Premier travellers can take advantage of complimentary snacks and refreshments, a wide selection of newspapers and magazines, Internet connection, complimentary Wi-Fi access and live news updates. Comfortable Business Premier carriages offer the ideal working environment, with space to work in large, comfortable seats, and at seat power sockets. What’s more you’re free to use electronic devices on board (no fears about electromagnetic interference when you’re not up in the air), so there’s no problem making phone calls (apart from when you’re in the tunnel), or turning on your laptop to prepare for that important meeting at the end of your journey. Business Premier lounges offer complimentary Wi-Fi. Ask a member of staff in the lounge for details of how to connect. At Ashford International, Business Premier travellers are entitled to free Wi-Fi access in the main departure lounge. If you get bored by the annual report you can always pick up a newspaper and catch up on world affairs (and if you’re feeling intellectual, read it in another language). You need to check in at least 30 minutes before your Eurostar train departs. On peak trains, for example Friday evening services, it’s advisable to get there earlier. If you’re travelling with a Business Premier ticket, you can check in up to 10 minutes before departure and access the business lounges. Date of Travel for the Outward Journey?